Do you wish you had more wellbeing? Are you longing for an evidence-based approach to consistently feel good and function more effectively at work? Do you need busy-proof practices to help you more confidently navigate the lows and highs we all experience? In its simplest form, wellbeing is your ability to feel good and function effectively. It gives you the resources to navigate the highs and lows that we all experience in our daily lives. Wellbeing allows us to “be well”—feeling good physically, mentally, emotionally, spiritually, intellectually, and socially— and to “do good”—achieving what we would like to each day, be it at work or at home. 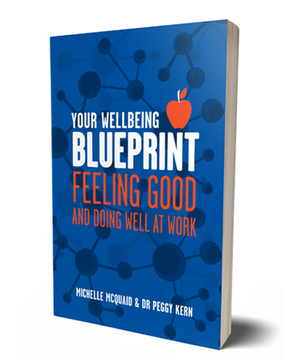 Your Wellbeing Blueprint: Feeling Good and Doing Well at Work distils three decades of research findings from the field of Positive Psychology. Best-selling author Michelle McQuaid and her colleague Dr. Peggy Kern will reveal practical ways to improve your wellbeing and become an informed, confident, and active steward of your own wellbeing so you can wholeheartedly show up and be fully engaged in life — whatever it throws at you. Click the green “Add to Cart” button above to order your copy of Your Wellbeing Blueprint today.